On the night of September 10, 1954, the famous alleged encounter by Marius Dewilde in Quarouble in the Nord took place. The very strong media impact of the event at the time had prompted ufologists to seek out other witnesses. "On September 10, 1954, in the evening, I had taken up my post at 10:00 p.m., as the engine room manager at the Eau et Force company pumping station in Vicq, near Quarouble. At about 10:30 p.m. something weird occurred: a powerful white illumination outside appeared to me, invading the whole station, while at the same time I noticed a sharp drop in electrical voltage on the circuits. We were powered directly in very high voltage, and we transform the power ourselves. Everything "shut down", and we had no poser anymore. The illumination lasted for a short time, and disappeared, and I was obliged to put everything back on its way, and it took me about one hour." "My wife arrived a few moments after the incident, accompanied by our little girl, and informed me that she had seen an unexplainable phenomenon on the way (she was walking from our house 100 meters from the station): a beam of light descended from the sky obliquely, enlarging enormously. It seemed to be searching the area: first the surrounding woods, then the pumping station, in detail. She did not see the object that emitted the beam, but the beam, of a bright white, close to its source, covered the entire station on the ground. In spite of the calm outside, she heard no sound. After a few movements, the beam retracted, and disappeared." "For my part, I noticed that my automatic wristwatch was stopped. It never worked again. I kept it, for it was a valuable watch." "The next day I learned by public rumor about the fantastic Dewilde affair, a man whom I knew very well, and who, despite the disparagement he suffered on that occasion, had always seemed very balanced. I believed in his statements, and I thought I would bring my testimony in support of his own. So I went to the place where I said a few words to him, but he was very busy and overwhelmed by the investigators of the various official services, the journalists and the curious. I saw the notches on the railway sleepers, and the blackened ballast... I could therefore not, at the time, bring my testimony and that of my wife, given the concordance of the time and the proximity of the two sites, distant one of the other of less than 2 km in straight line. But seeing the situation and not wanting any trouble, I decided to be silent..."
Jean-Marie Bigorne, also a field ufologist operating in the Nord, explained in his 2014 book that he had been able to record the testimony of a person in charge of the engine room of the Eaux et Forêts - the public water services - in Vicq, who at the date and time of Dewilde encounter had seen an illumination and noted a strange failure of the apparatuses he was in charge of. His wife who was outside had seen a light beam bathe the pumping station. Two years later, his friend ufologist Joël Mesnard mentioned in his own book the find of Jean-Marie Bigorne, adding that the pumping station man was named Felix Crétu, and that he had spent part of the night in restarting his failed instruments. The same year, 2016, the "skeptical" ufology Dominique Caudron mentions this observation only by indicating that it is of little use because the report is late, and because "certain details (mysterious failure) seem imported from the ufological mythology." "On September 10, 1954, in the evening, I had taken up my post at 10:00 p.m., as the engine room manager at the Eau et Force company pumping station in Vicq, near Quarouble. At about 10:30 p.m. something weird occurred: a powerful white illumination outside appeared to me, invading the whole station, while at the same time I noticed a sharp drop in electrical voltage on the circuits. We were powered directly in very high voltage, and we transform the power ourselves. Everything "shut down", and we had no poser anymore. The illumination lasted for a short time, and disappeared, and I was obliged to put everything back on its way, and it took me about one hour. My wife arrived a few moments after the incident, accompanied by our little girl, and informed me that she had seen an unexplainable phenomenon on the way (she was walking from our house 100 meters from the station): a beam of light descended from the sky obliquely, enlarging enormously. It seemed to be searching the area: first the surrounding woods, then the pumping station, in detail. She did not see the object that emitted the beam, but the beam, of a bright white, close to its source, covered the entire station on the ground. In spite of the calm outside, she heard no sound. After a few movements, the beam retracted, and disappeared. For my part, I noticed that my automatic wristwatch was stopped. It never worked again. I kept it, for it was a valuable watch. The next day I learned by public rumor about the fantastic Dewilde affair, a man whom I knew very well, and who, despite the disparagement he suffered on that occasion, had always seemed very balanced. I believed in his statements, and I thought I would bring my testimony in support of his own. So I went to the place where I said a few words to him, but he was very busy and overwhelmed by the investigators of the various official services, the journalists and the curious. I saw the notches on the railway sleepers, and the blackened ballast... I could therefore not, at the time, bring my testimony and that of my wife, given the concordance of the time and the proximity of the two sites, distant one of the other of less than 2 km in straight line. But seeing the situation and not wanting any trouble, I decided to be silent..."
This ufologist from the Nord department indicated that among the confirmations of the testimony of Marius Dewilde on his encounter of September 10, 1954, that he had been able to collect the testimony of a responsible of the engine room of the Waters and Forests services in Vicq, who, at the time of Dewilde's encounter found an illumination and a strange failure of the apparatuses. His wife who was outside saw a light beam bathe the station. Further in his book, he indicates that this testimony was recorded in 1976, published in LDLN 371, that the witness was Félix Cretu, 42 years old in 1954. 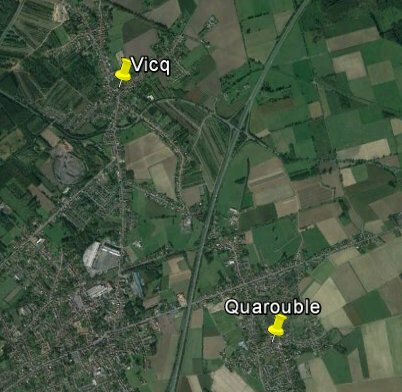 The witness testified that he took up his post at 10 p.m. on September 10, 1954, as the person in charge of the engine room at the pumping station of Eau et Force in Vicq near Quarouble. Around 10:30 p.m., a powerful white illumination appeared, and invaded the whole station, and at the same time he noticed a sharp drop in electrical voltage on the circuits. They were served in high voltage, the station having its own transformer. Everything went off, there was no power, the machines stopped. The illumination lasted a short time and disappeared. It took him about an hour to restart everything, alone. His wife arrived a few moments after the incident with their little girl and told her that on the way, walking from their home 100 meters from the station, she had seen an inexplicable phenomenon consisting of a light beam which came down from the sky obliquely and widened enormously. The beam seemed to search the surroundings, first the nearby woods, then the pumping station in detail. She did not see the object that emitted this beam, which, intense white and narrow at its source, covered the entire station's grounds. Despite the silence of the place, she did not hear any noise coming from the phenomenon. After a few movements, the beam retracted and disappeared. Félix Crétu found that his wristwatch was no longer functioning, and it never worked again afterwards. He kept it, because it was a valuable watch. The next day, Félix Cretu learned the adventure of Marius Dewilde, by public rumor. He knew him very well, as someone who seemed to him to be very balanced despite the denigrations after his case, and he believed his statements. Felix Cretu went to Quarouble to say a few words to Marius Dewilde, but the latter was monopolized by the official investigators, journalists and the curious. Félix Cretu saw the cuts in the railway sleepers and the blackened ballast. Because of the correlation of place and time, Félix Cretu had considered adding his testimony to that of Dewilde at that time, but gave up to avoid trouble. Joël Mesnard indicates that ufologist Jean-Marie Bigorne recorded the testimony of a guardian of a pumping station, Felix Crétu, who had seen the evening of the observation of Marius Dewilde, at the same hour, a luminous phenomenon in the sky. The instruments with which the witness was in charge of had failed at this precise moment, and he had spent part of the night in putting them back to operation. I can only note this information. I do not see an obvious ordinary explanation. However, the alleged facts are reported belatedly. There is also a lack of durations, angular sizes, etc. [bi1] "Chasseurs d'OVNIS - Mémoires d'un Enquêteur de Terrain", book by Jean-Marie Bigorne, Le Temps Présent publisher, France, page 165, pp 168-169, 2014. [jm1] "Les Apparitions d'OVNIS: Les dossiers non classés", book by Joël Mesnard, Le Mercure Dauphinois publisher, France, 2016. 1.0 Patrick Gross January 28, 2017 First published.